It’s October, and that means it’s pumpkin season! 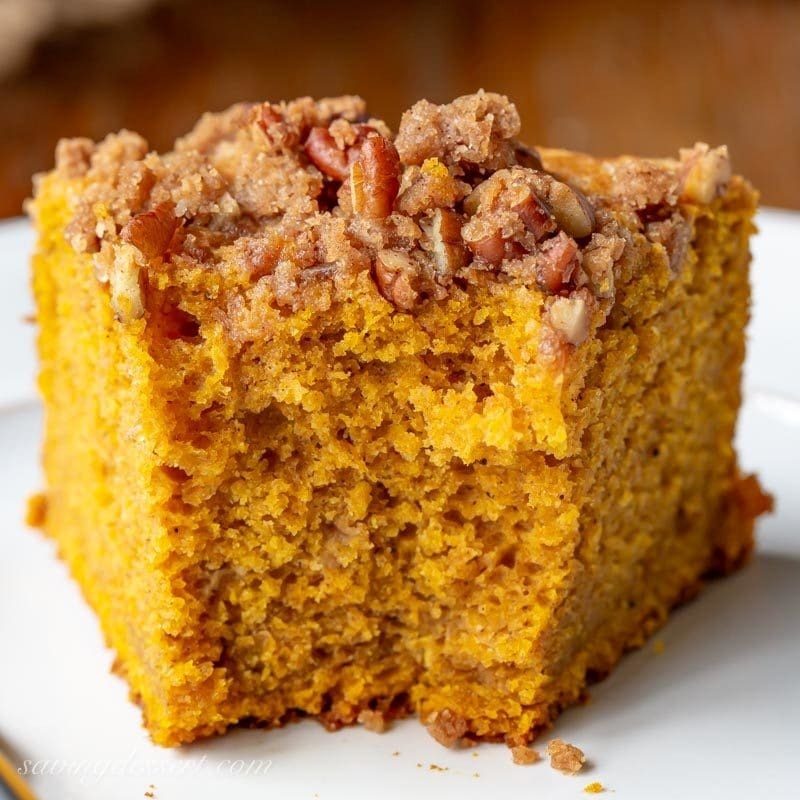 I am so ready, because I love to cook and bake with pumpkin, and create recipes like this Pumpkin Breakfast Cake with Pecan Crumble. All our “breakfast cakes” are great for breakfast, brunch, lunch, afternoon tea, as a light dessert or a midnight snack. With a wonderful soft, moist crumb and a crunchy, sweet crumble top, you and your guests will remember this cake long after it disappears. The reviews are in… everybody LOVES this cake and I know you will too! Even the folks that don’t usually go all mushy with praise have fallen in love with this cake, and asked for more. We have several different groups of taste-testers: family members, co-workers, neighbors, and drop-in guests. We’ve received enthusiastic thumbs up from everyone across the board. Many commented about how much they love the delicious pecan crumble topping. Our fire-fighting, obstacle race-running son, who’s usually not a pumpkin lover, even texted his approval noting “that’s pretty freaking good!” He’s often my toughest critic so I feel pretty happy about that feedback. What is a breakfast cake anyway? If you’ve followed SRFD for very long, you’ve probably noticed that I have a thing for simple, lightly-sweet seasonal cakes that are perfect with coffee in the morning, tea in the afternoon, or anytime really. Breakfast cakes are made with less sugar than most other cakes, but still have a nice hint of sweetness from fresh fruit or crumble tops. Not as sweet as doughnuts or coffee cakes, our breakfast cakes are easy to make. They can be served slightly warm or at room temperature, and keep well for several days. This is the kind of treat you’d expect to find at a lovely Bed & Breakfast or Sunday brunch. 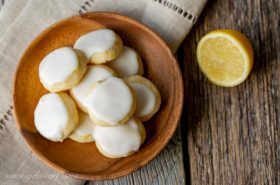 Weekend baking is a pleasure and this is the kind of treat you’ll want to try next time the family is lingering around the house. 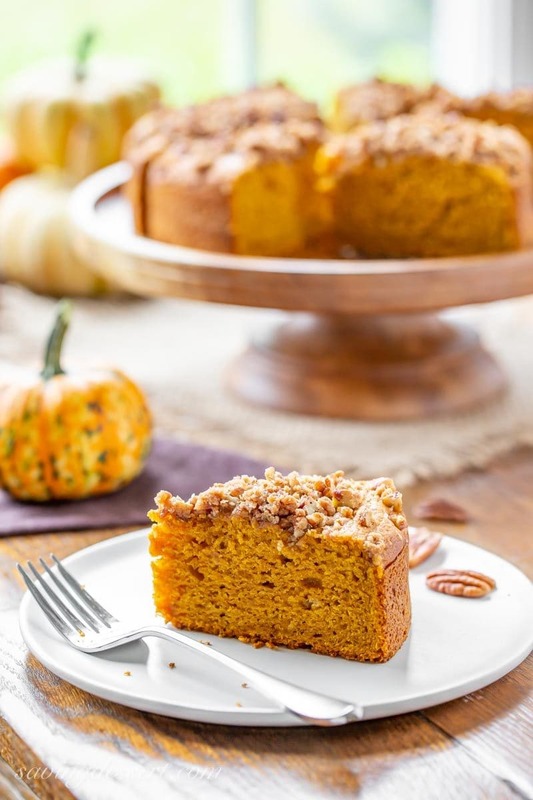 Pumpkin is a natural base for this kind of cake. It lends moisture, color and flavor – the big three! And for icing on the cake (so to speak) the toasty pecans have delicious caramel notes from the butter and brown sugar. 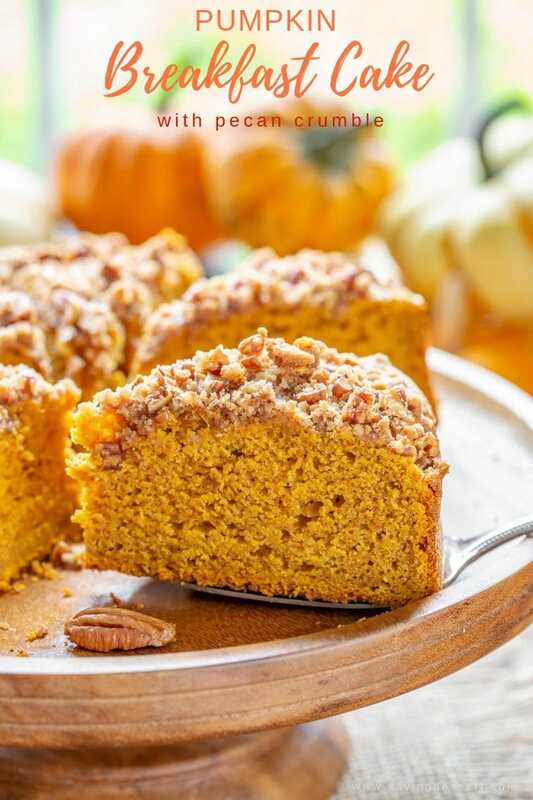 Loaded with pumpkin pie spice in both the cake and crumble top, the warm flavors of fall really shine. This cake is very easy to make and you don’t even need a mixer! You probably have everything you need right in your pantry. No worries if you don’t have a springform pan, it will bake up nicely in a square pan too. Well tested and perfected, this is the cake you’ll want to make throughout the season. 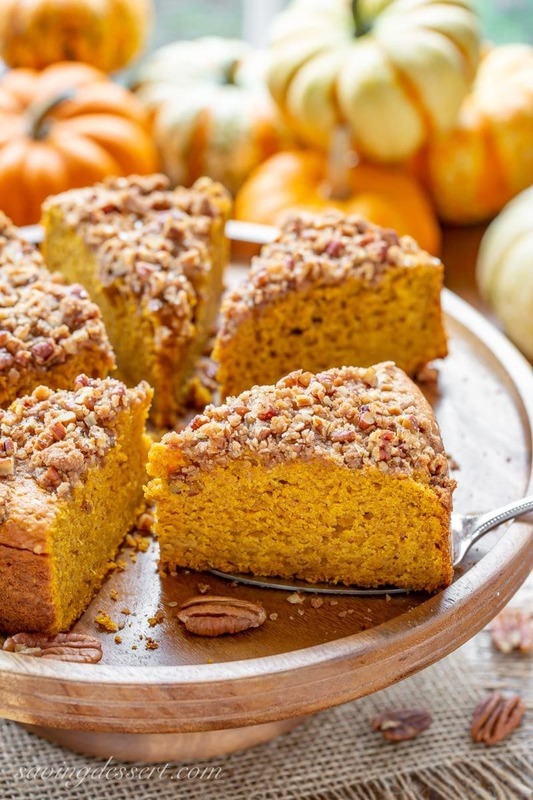 The moist, well spiced, tender pumpkin cake and the crunchy, toasted pecan crumble is a match made in pumpkin heaven! 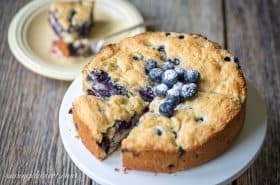 Blueberry Breakfast Cake – This luscious cake is a deliciously moist, lightly sweet “coffee” cake bursting with juicy ripe blueberries and a hint of lemon. 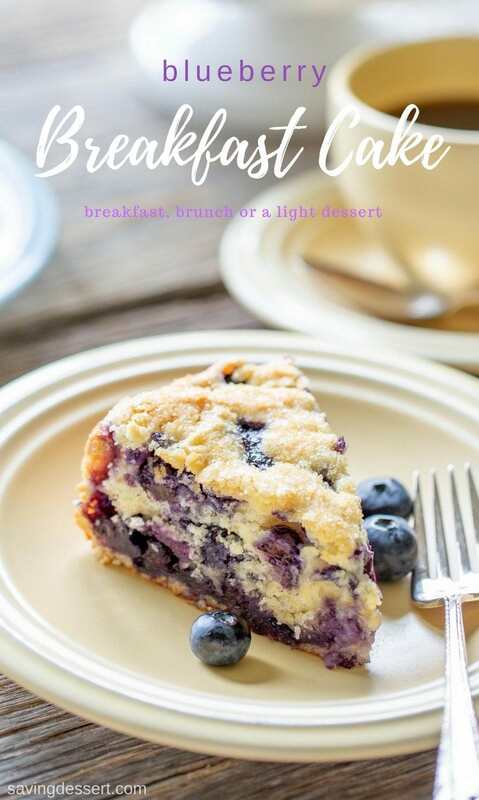 Click HERE to get the recipe for Blueberry Breakfast Cake. Raspberry Ricotta Breakfast Cake – A deliciously moist and fluffy, berry-streaked breakfast cake perfect anytime! Made with frozen raspberries so it’s easy to make all year long. The addition of ricotta adds a creamy tanginess to this cake along with incredible texture. A must try for raspberry lovers. 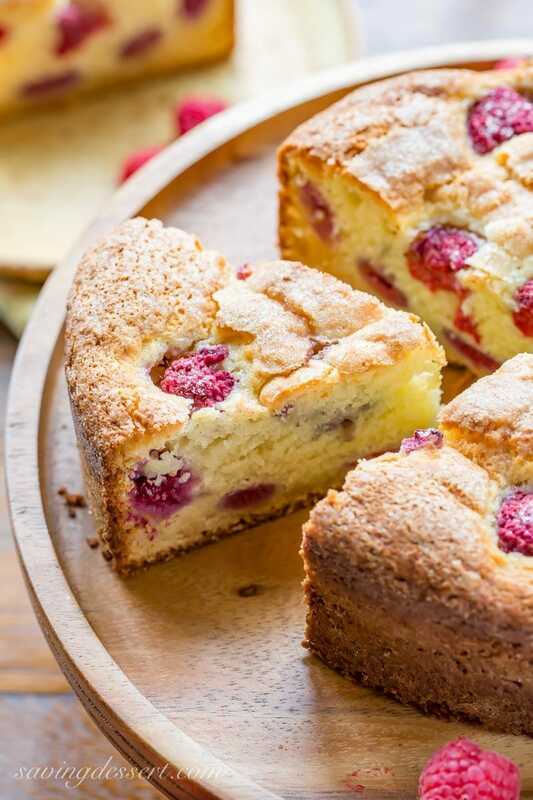 Click HERE to get the recipe for Raspberry Ricotta Breakfast Cake. Cranberry Almond Breakfast Cake – Are you having out-of-town company for the holidays? Do you have every bedroom, nook and cranny filled with your favorite relatives? Sounds like fun! 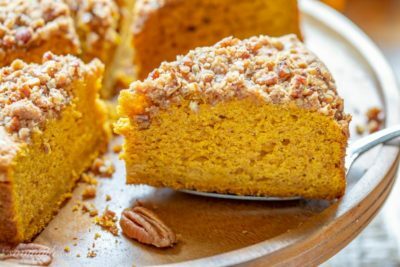 But I think you’re going to need this recipe because it’s perfect as a breakfast (coffee) cake, snack cake, light dessert after lunch or even a midnight nibble. 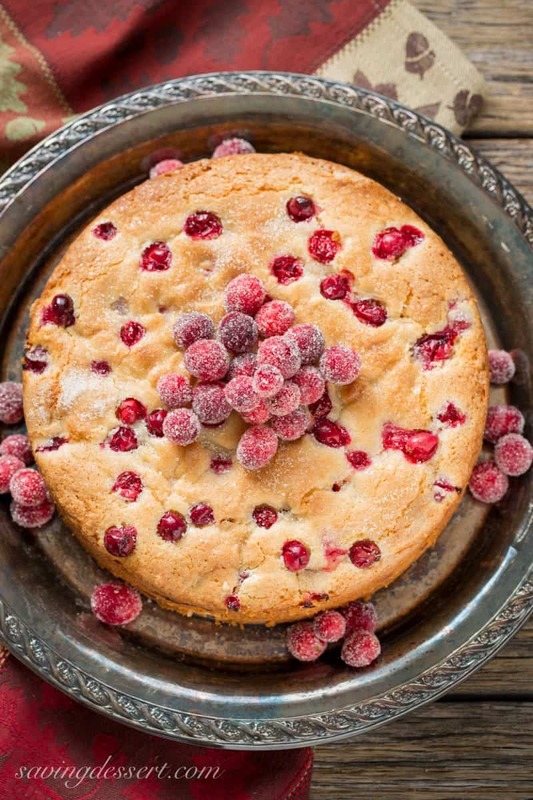 Click HERE to get the recipe for Cranberry Almond Breakfast Cake. Baking is a breeze in this 8-inch non-stick springform pan. We love the leakproof design with an easy removable waffle bottom and quick-release latch. This pan is a favorite in our kitchen and very affordable too! With a wonderful soft, moist crumb and a crunchy, sweet crumble top, you and your guests will remember this cake long after it disappears. In a small bowl stir the pecans, brown sugar, flour, butter, and pumpkin pie spice together until well combined. Refrigerate until needed. Preheat oven to 325F. Turn the base of an 8-inch springform pan upside down so you can easily slide the cake off. Lightly spray the pan with vegetable cooking spray. Line the bottom with a round piece of parchment paper. Set aside. In a large mixing bowl, whisk together the flour, salt, baking powder, baking soda and granulated sugar. Make a well in the center and set aside. 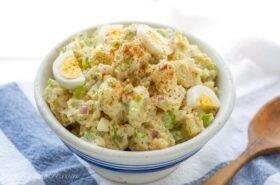 In a small mixing bowl lightly whisk the eggs. Add the pumpkin puree, melted cooled butter, vanilla and milk. Fold together with a rubber spatula until blended. Pour the pumpkin mixture into the flour mixture and fold together with a spatula until the flour is incorporated. The batter will be thick. Gently scoop the batter into the prepared pan and smooth the top with an off-set spatula or back of a spoon. Set the cake aside and allow it to rest for 10-15 minutes before baking. This step helps give it some loft and puffiness. When ready to bake, top with pecan crumble. Bake at 325F until a wooden skewer comes out with clean, about 55-60 minutes. Tent with foil after 30-minutes to prevent over-browning of the pecan topping. Allow the cake to cool on a rack for 30 minutes before removing the sides of the pan. Slide onto a serving plate, cut into wedges and enjoy slightly warm or cooled. Store leftovers in a sealed container at room temperature for a day or two, or refrigerate for longer storage. To make your own pumpkin pie spice combine 2 teaspoons cinnamon, 1/4 teaspoon allspice and 1/4 teaspoon ginger. 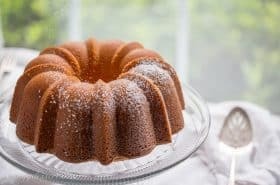 If you don’t have a springform pan, you can bake this cake in a 9-inch square pan or a 9-inch springform pan. Reduce the baking time to 40-50 minutes and increase the temperature to 350F. You can also use a high-sided 9-inch layer cake pan but for easy removal I recommend the springform pan. I use a dark, non-stick springform pan for this recipe. Freeze leftover canned pumpkin in an airtight container for up to a month. 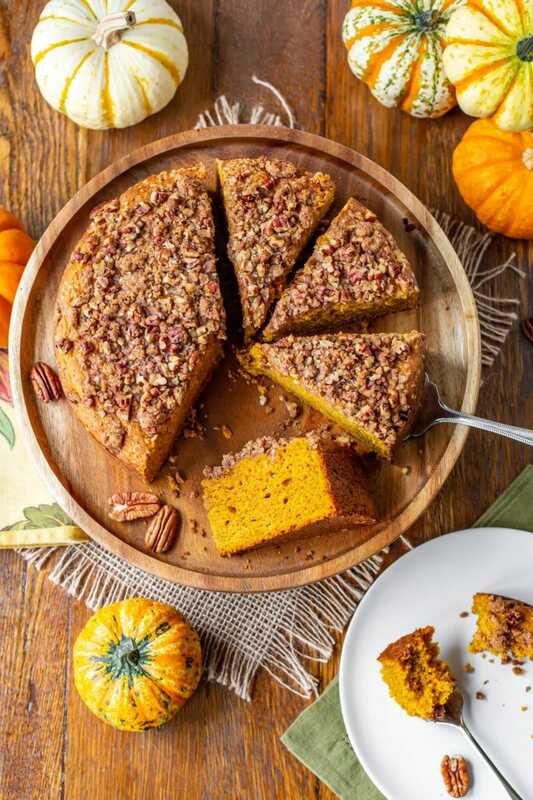 You can add my vote, with the pecan crumble topping your pumpkin cake sounds terrific. Thanks Karen – it’s a favorite of mine! So where is the recipe? I’ve scrolled & scrolled looking for it. Hi Bobbie. The recipe is at the bottom of the post. 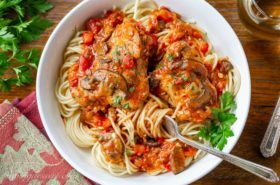 The printable recipe is always at the bottom and is shaded in beige just above the comments. Hope you give it a try, it’s so delicious! Oh, my gosh, I want a slice right now! This breakfast cake looks scrumptious!! Pinning! 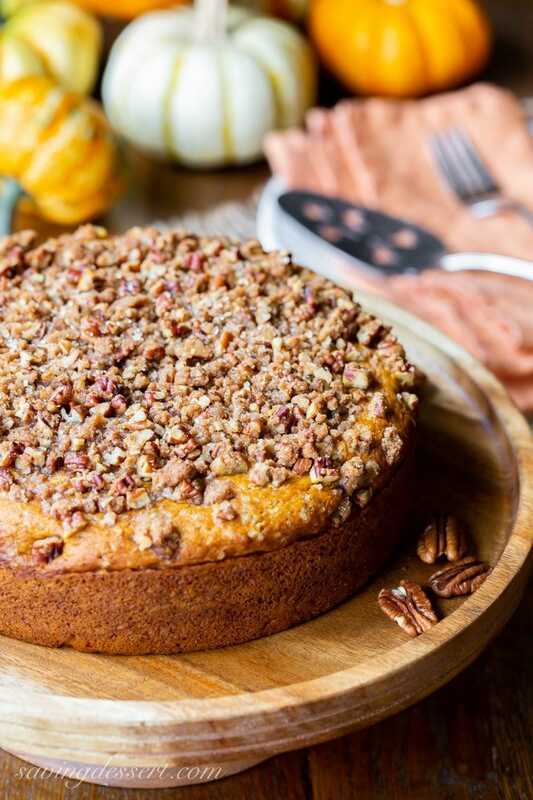 This is my kind of cake too, Tricia, especially with that beautiful pecan topping! It looks wonderful! Pecan crumble?!! Sign me up! I’d put it on everything, but it’s particularly nice with this wonderful looking pumpkin cake. I’m all for cake in the morning, and this is perfect — not at all over-the-top. Sophisticated, you might say. Good stuff — thanks. Oh, Tricia! You did it again, another amazing breakfast cake! I love everything about it, it looks so moist yet light too. And that topping, I LOVE it! This looks wonderful – I’m printing it! It would be perfect for munching around Thanksgiving. My daughter is coming home with her new boyfriend. we’re so excited! Thanks so much Mimi! I know you must be over the moon excited about your daughter coming home – and with a new guy too – very special indeed! You’re going to love this cake – it is fantastic! Thanks again and have a wonderful holiday. Oh, looks delicious, Tricia! I know Bill would love this if I made it. Thanks for the recipe and have a wonderful week! Definitely my kind of breakfast! I adore pumpkin in anything and everything, and this is the perfect way to start a fall day, thanks Tricia! So much better than other sweet breakfast treats – we love it! Wishing I had this delicious cake in front of me right now. It would be perfect with my morning coffee. Or my afternoon coffee 😉 Such a great treat for the Fall!